An endangered species biologist is a scientist who is dedicated to studying animal and plant life which is currently at risk of extinction. They may be interested in any organic life which is currently under threat, from the smallest insects through to the tallest trees. Why are Endangered Species Biologists important? Ecology is very important, because all life on Earth is interconnected. When an animal becomes extinct, it can have a huge impact on the food chain that it is part of. The things that fed on that animal will start to go hungry, whereas the things that the animal previously fed on may subsequently experience a population boom. 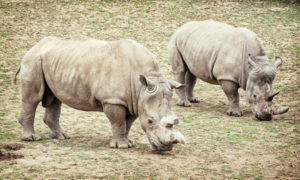 The effects of extinction can have global implications. What is more, biodiversity helps to make the natural world truly magnificent. The world would be a much duller place without some of the amazing species that are alive today. Many of these animals are threatened because of human behaviour, so it is important that humans start to take steps to limit their own impact. What do Endangered Species Biologists do? • Administrative tasks relating to endangered species projects. What sort of species to Endangered Species Biologists work with? The types of animals that Endangered Species Biologists work with can also depend on the biologist’s job role. Many people think that all Endangered Species Biologists work with “glamorous” animals like polar bears, tigers, rhinos and whales, however there are thousands of other species that are considered to be endangered. In fact, it is just as important to protect the “unglamorous” insects because their disappearance could be felt throughout the food chain. Where do Endangered Species Biologists work? Endangered Species Biologists can be found in a number of different places, from laboratories to offices, to out in the field. Their main place of work may depend on their role and how their skills are being utilised. There are job opportunities for those with a specialism in Endangered Species Biology in government departments, conservation charities and international organisations, such as the United Nations. Corporations and businesses may also hire endangered species biologists so that they can assess the potential impact of their behaviour on the flora and fauna in the area in which they are presently operating or planning on operating. An Endangered Species Biologist can help to limit the potential impacts that corporate organizations have on the environment. Endangered Species Biologists may also be employed by zoos or animal sanctuaries. Many zoos now operate breeding programmes or run conservation efforts. As part of a breeding programme role it is important to consider how to increase species numbers, but biologists must also consider the feasibility of releasing animals into the wild if they were raised in captivity. Working as an educational officer is another major opportunity for a person who is trained as an Endangered Species Biologist. Running public lectures and talks is a great way to raise awareness about endangered animal species and to discuss opportunities to save those animals.